The Amazing Trump Stock Market Boom! Since the Trump election, the US stock market has moved nearly straight up with almost no corrections. Putting this into perspective, Jonathan Krinsky, Chief Market Technician for MKM Partners, told Financial Sense Newshour on Saturday that it's now been 18 months since the last 5% decline, and around 14 months since even a small 3% decline. “Both of those are the longest streaks in history back to 1928,” Krinsky said. We are seeing some overbought readings in the weekly and monthly RSI that we’ve only seen a handful of times throughout history as well, he noted. The bigger picture, however, is that every time we’ve seen such extreme overbought readings on a monthly and weekly basis, Krinsky stated, almost none of those instances marked a major market top. Is there Still Room for Gains? While we’re seeing stretched valuations and overbought signals akin to what we saw in the 1999 Internet Bubble, the largest difference between what we have now and what we had then is the underlying breadth of this market. In the late 1990s, we saw narrowing leadership with a handful of stocks doing all the heavy lifting. 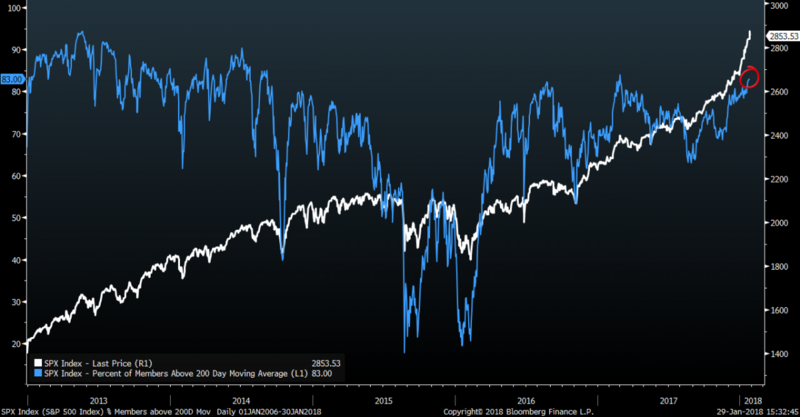 Currently, 83% of stocks on the S&P are over their 200-day moving average (see chart below) and the cumulative advance-decline lines continue to make new highs. The underlying backdrop of the credit markets remains pretty constructive, as well. Interest rates recently broke above the key 2.63 to 2.64 level from a short-term basis, Krinsky stated. That opens the door for a move up to 3 percent, which is a psychologically important level and represents a bit of a downtrend from the 2008 highs. 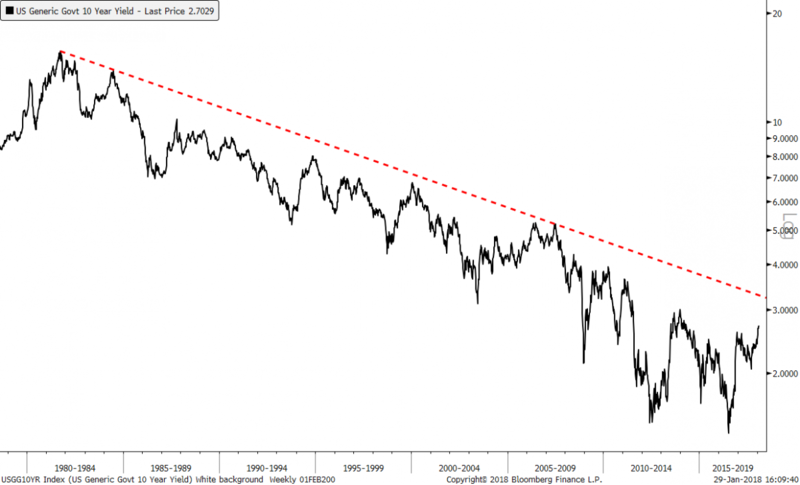 However, before we can say that the secular bull market for bonds is over, he added, we really need to see closing prices above 3.25 to 3.5 on the 10-year to break those long-term downtrends that have been in place for 30 to 40 years (see chart). Not much jumps out as being particularly problematic here. “If we were to go straight to 3 percent (on 10-year yields) in a couple days, that might spook some parts of the market,” Krinsky said. The dollar has also been declining for a while year-to-date, and that has boosted parts of the market, and especially emerging markets. A snap-back in the dollar could certainly rattle some parts of the market as well, Krinsky noted, and we certainly are getting some downside extreme levels in the U.S. dollar. There’s only modest evidence for an increase in inflation here, Krinsky added, but there’s not enough evidence to suggest a threat to markets. Overbought conditions similarly aren’t signaling trouble, necessarily. As long as the Fed doesn’t move too quickly to raise rates, this market should have room to run. If the Fed is moderate or slow, is it possible this goes on for another 18 to 24 months. 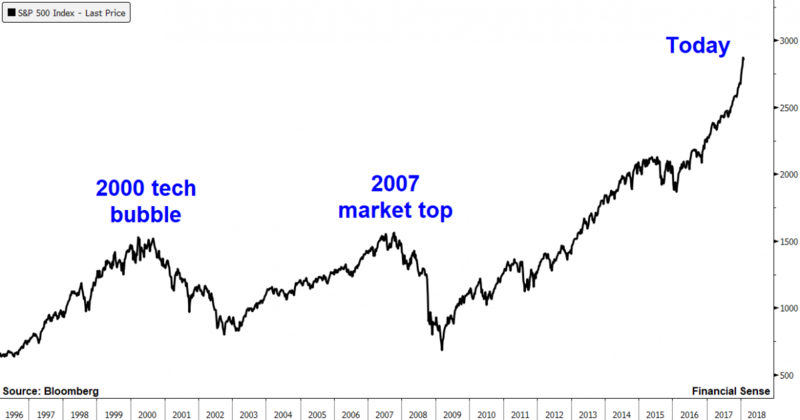 We broke out of a 12-year secular bear market in 2012 to 2013, so that argues we have more room to run. Investors need to be involved in this market, but from a tactical perspective, they should leave a little dry powder for that inevitable dip we will probably get this year.